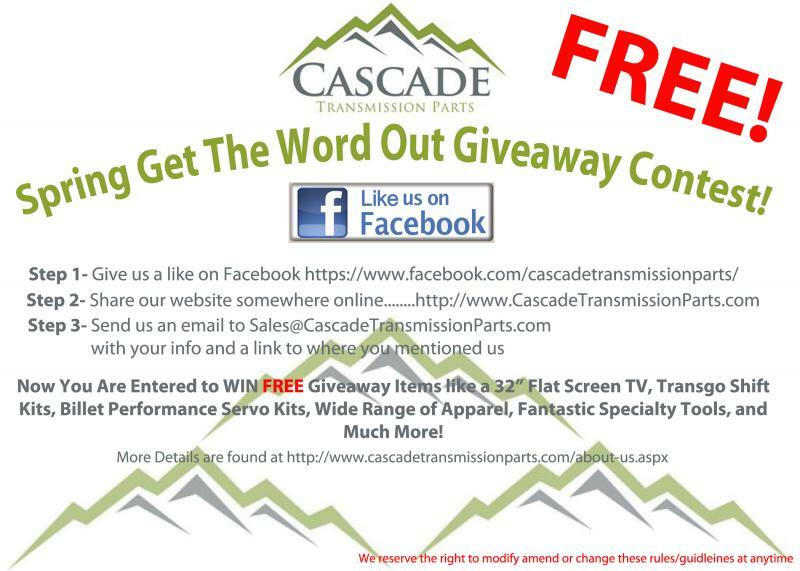 We Want To Give Away Some Great Stuff To Existing & Potential Customers ! 32" Flat Screen T.V. , Transgo Shift Kits , Billet Performance Servo Kits , Wide Range Of Apparel , Some Fantastic Specialty Tools , + Much More ! There will be a minimum of 50 Names Drawn For Goodies! This also makes the odds of getting more than one item a strong chance. We reserve the right to modify amend or change these rules / guidelines at anytime. Our Goal With This Is General Promotion Of Our Website , And Obviously Drawing More Traffic To Our Website ! No Cost To Anyone That Enters , Simply a few mins of your time - Post Us Around The Net !